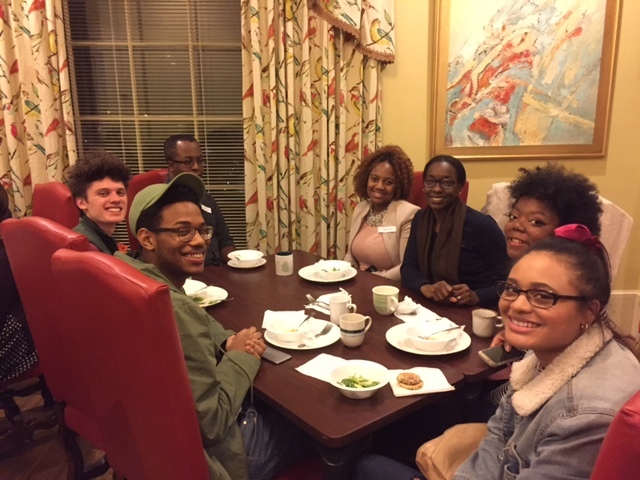 The Belmont University Honors Program and Fisk University’s Honors Program recently partnered to meet for a dinner of homemade chicken-noodle soup and bread along with a performance of “Romeo and Juliet,” starring recent Belmont MFA theater performance graduate Morgan Davis as Juliet. Dr. Jonathan Thorndike, director of Belmont’s Honors Program, and Dr. Beverly Schneller, Belmont’s associate provost, worked with Dr. Patrick Fleming of Fisk University to organize the special event held in Belmont’s Honors House. The Honors Program has sponsored a dinner each year since 2012 and has helped students to attend the Nashville Shakespeare Festival’s (NSF) professional productions at Belmont’s Troutt Theater. The NSF began an annual Winter Shakespeare production in 2008 after many years of producing outdoor performances each summer and fall in Nashville’s Centennial Park. This allowed the festival to expand its repertoire to include plays that benefitted from a more intimate indoor venue. The Trout Theater allows the NSF to provide both public performances and daytime school performances for area high schools. The first eight winter productions served more than 35,000 students and adults from around Middle Tennessee.